Jersey Mike's on 105 Drury Lane, LaPlata, MD will be hosting a fundraiser for our department on Saturday, April 21, 2018 from 10 am- 9 pm. They will be donating 15% of the daily sales to PHVFD&RS. 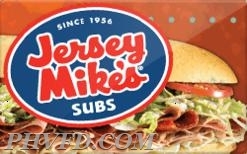 It will be a perfect day for a freshly sliced, authentic Northeast-American style sub sandwich on fresh baked bread. Enjoy it Mike's Way or Your Way! Hope to see you there. As always...we appreciate your dedication and support to our department!